All of this information goes into word documents and spreadsheets but these are also full of information for the business of exhibition design and construction – like object dimensions, locations and weight or photograph identification numbers and sources – not just the content of the exhibition that visitors see. It is when the physical and visual design process starts that an exhibition really comes to life. 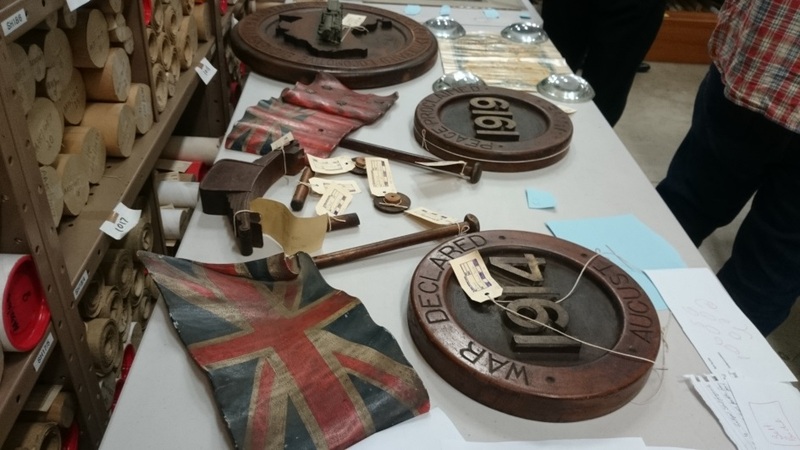 At The Workshops Rail Museum we are currently working on a new exhibition examining the role of railways in the First World War. Curatorial research on this exhibition has focussed on the railways operating on the Western Front (and other theatres of war) along with the railways at home in Australia, carrying troops, horses, Red Cross packages, mail and even the messages of recruitment. Over the last several months we have been gathering stories about railway companies, railway workers at war, and how Australia galvanized at home for operations in a war the other side of the world. We have assembled objects, photographs and archival material that tell these stories and identified thematic topics through which to tell the stories. And we’ve been putting together those prosaic word documents and spreadsheets. Commemorative plaques believed to have been commissioned by the Federated Railway Locomotive Engineers Association of Australasia. But now the development of the exhibition has moved to the next exciting (for me at least) stage of physical and graphic design. 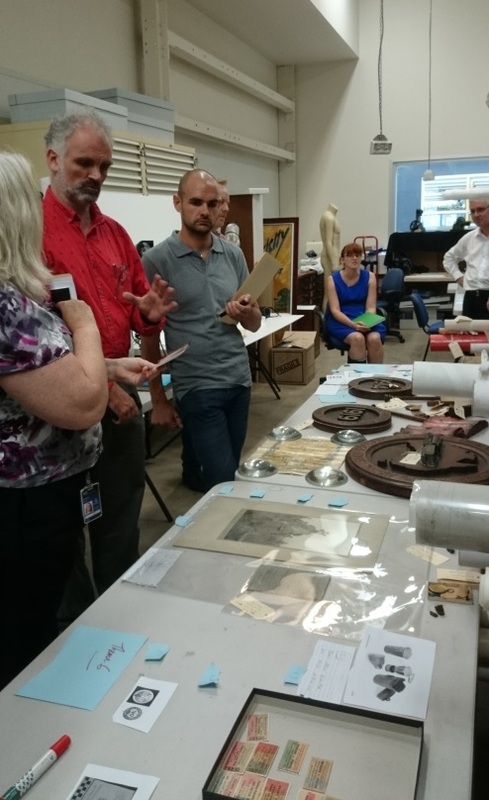 In this part of the process, Queensland Museum’s exhibition design team begin work. Taking the words and concepts curators have gathered, with the themes and tone we are aiming for, the designers come up with schemata to make these ideas into a three dimensional, physical entity that has a certain look and feel and aims to make an emotional and memorable impact for people visiting the exhibition. The objects that curators have grouped together to show an aspect of the story are now assessed for how best to display them. Considerations of space, mounting, lighting, what angle to best view the objects and how to arrange them so that connections to ideas are apparent, are all part of the process of design. The movement and viewing perspectives of the exhibition cases and panels are also considered. For the interpretive panels, colour and motif, together with how to use the great images we have found are the commission of the graphic designers. These two parts of the creative design process are where the exhibition truly comes alive. QM exhibition project team including designers, project manager and curators discussing potential display methods for objects. So when we start to go through the content with designers, looking at objects, talking about the feelings we want to provoke in our audience, share the stories that have resonated with us when discovered in the research phase, and get the response from designers – that synergy of conception where great ideas flow from a single story or object which works for the exhibition as a whole or perfectly capture the essence of an idea – that is when an exhibition truly comes alive. As a curator, there are for me two other moments as gratifying as the commencement of design. One is that final breath of relief taken when you look around a completed exhibition before it opens and think “we did it”. At that point the decision making, selection, tension of ideas versus reality, all come to fruition. The other moment is seeing a visitor really connect with an aspect, a story, an object in the display. See someone else experience the connection or the discovery you felt when you first encountered that moment. For these moments to be all we hope for, an evocative design is essential. And so this week, as the design work for our exhibition commences, it really is an exciting moment. 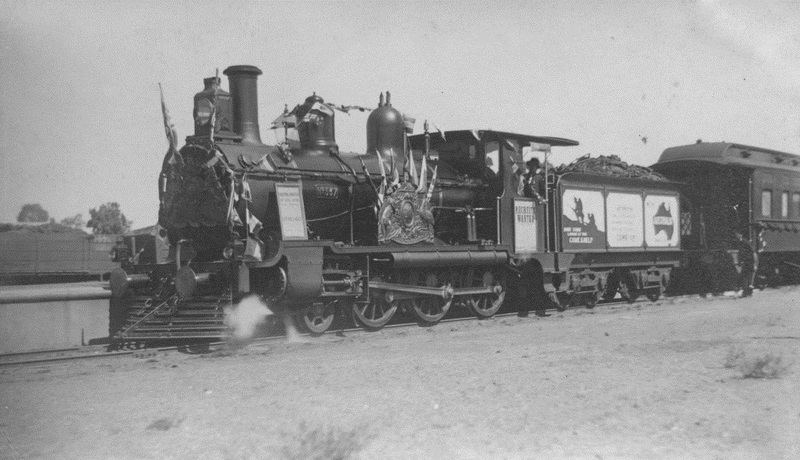 Recruitment and War Bond train, Emerald, c1916. The Workshops Rail Museum / Queensland Rail collection. This project is proudly supported by the Queensland Government. This project has been assisted by the Australian Government through the Australia Council, its arts funding and advisory body.